Adlib provided full production for Jack Whitehall's sold out, 3 week ‘At Large’ UK arena tour. The show was managed by TPi Award winning production manager Neil McDonald, who made sure everything was organized and that there was a great flow of communications. Johnny Dodkin was the ever-cheerful tour manager who kept everything in check and Adlib were thrilled to be back working with Chambers Touring on another exciting comedy project. Steve “Patto” Pattison mixed FOH, working with a strong team from Adlib including monitor engineer / sound crew chief Marc Peers and systems tech Tony Szabo, KSE, who was responsible for the precision and detail required to ensure that every seat in the house had crisp, clear and audible speech. To ensure every punch line reached the far corners of the theatre, a large amount of speakers were needed. The front PA hangs – in their largest configuration – comprised 14 x K1 with four KARA downs, with side hangs of 12 x K2 … increased to 16 for the largest venue, London’s O2 Arena. The delays were typically 6 x K1 in two hangs with flown amp racks for easier cabling and improved sightlines. A total of 46 x amplifiers were used, mostly the new LA12X (including flown racks). A total of eight SB28 subs were only active for the grand entrance at the top of Act 2 and for the walk-in / intermission music. All of the front and lip fills were KARA, picked for their low profiles and to cover the first 10 metres of the stalls, and one additional KARA box was on the front centre of stage as a prop! Taking care of the processing was one of Adlib’s Lake / Dante fibre systems and Tony used Meyer SIM 3 & SMAART v8 for audio analytics and measurement. Patto’s console of choice was a DiGiCo S31 – a first time out for both him and Tony – while Marc used an S21 for monitors. Needing only 8 channels, the tiny footprints of the consoles were an ideal mix of quality and size for the application. The stage box was the DiGiCo SD Rack bringing the same pre-amps as the larger consoles connected via a hi-definition BNC coax cable from FOH to stage, run at 48K to allow for full redundancy in both directions – so both consoles effectively would have backed each other up in the event of an incident. Marc Peers’ set-up utilized one of Adlib’s Wardrobes, a configurable double width case - in this case containing SD racks, UPS and RF units, shout speakers, power distro - designed for push-in-plug-in-power-up convenience and speed. Also included was a brand-new Green-GO network based digital intercom system. This was used for all the show communications, connecting lighting, sound, video, stage management and show calling via a mix of wireless and wired headsets. Marc had two flown ARCS boxes for side fills – clarity over volume - two wireless DPA headset mics, two hand-held mics and one set of Sennheiser IEMs. The lighting and video elements of the production equation were coordinated by Adlib’s Kevin Byatt who was also a crew-chief on the road. Lighting designer Tom Webber was on his first Jack Whitehall tour. Due to the scale of an arena show, many people are watching Jack Whitehall on the IMAG screens to catch the close-ups and facial expressions involved to get maximum impact for the gags. Style wise, the show called for a theatrical approach while treating the venue as an arena show with a more cavernous space in mind. The first half was played in a true stand-up style with approximately 10 ft. of stage depth in front of a Kabuki curtain emblazoned with ‘Jack Whitehall’. 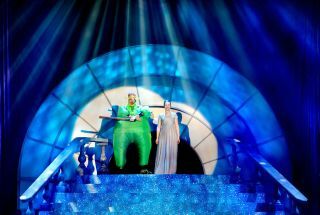 This dropped at the top of the Act 2 to reveal a set, complete with scenic pros arch and columns, with a circular staircase in the middle designed by Jonathan Paul Green, which was one of the starting points for both the lighting and video designs. Four lighting trusses were installed. The upstage one featured Martin MAC Aura LED washes with one MAC Viper Profile and there was an LED starcloth drop right behind. The upstage mid truss was rigged with 10 x Viper profiles and 6 x Auras, and the downstage mid truss had another four Viper Profiles and 6 x Auras. The front truss was in front of another that suspended the scenic pros arch, and on this ‘were five more Auras, which also doubled up to provide very effective back light for the first half. Flown in front of the stage was an advanced truss with 6 x Viper Profiles, 12 x MAC Quantum Washes and 13 Chauvet Strike 4 LED blinders to highlight the fans. There were also 10 x MAC Auras on the floor along with four ARRI 2Ks and eight CK ColorBlaze LED battens for some additional coloring to uplight the set. Jeff Bond came on-board as lighting tech and worked alongside Tom who operated the show, himself using two Hog 4s running in sync as live and backup. His challenge was to light the performance space generally and then to layer texture and atmospherics on top, as well as to execute a large number of very specific lighting cues which had to be spot-on in timing and location. The lighting package was completed with two of Adlib’s brand new Robert Juliat Merlin followspots. The IMAG mix was captured by three Sony HXC-100 cameras, operated by Adlib crew members Charlie Rushton (taking over from Jon Priest who left on paternity leave), Colin Telfer and Rob Bickerstaff and they also tech’d the LED screen. The two FOH cameras were fitted with Fuji 88 lenses, and the other one, anchored at stage left, with an HJ40 lens. They were directed by Iain Christie using a Blackmagic ATEM switcher. Playback content was supplied to Adlib by Whitehall’s own production team. It was stored and run from a laptop running QLab, operated by Matthew Brown and sent to Iain to output to the two IMAG screens. The screens were made up from 91 panels of Adlib’s Absen A3 Pro LED, each measuring 6.5 metres wide with a drop of 3.5 metres – the landscape format complimenting the stage design and the arena setting perfectly.